Our age needs a great inventor, the crazier the better, someone who won’t stop for anything and whose wit and creation skills are the foundation to make objects only present in movies or comic books become real. This is no easy task for nobody, but in this case we are talking about a true inventor of this era: Colin Furze. 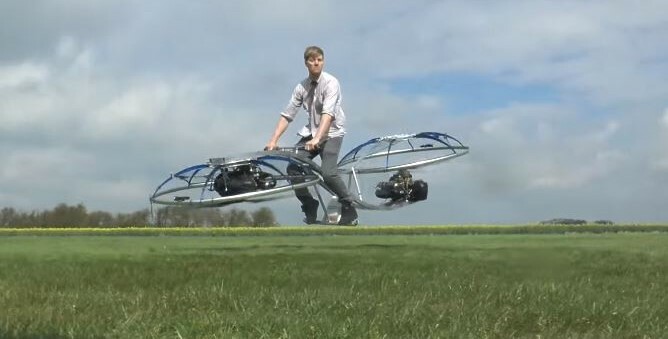 Colin Furze is a youtuber that has become increasingly famous worldwide thanks to his amazing inventions that range from a homemade hoverbike, Wolverine claws, a giant Star Wars AT-ACT Garden Den, even firework rocket launchers and much more. Every video is an astounding proof of skills, creativity as well as time and patience invested in every creation. This British inventor was born in Stamford Lincolnshire and ever since he was a boy, he has always had this curiosity for knowing how different objects work so that he could modify specific characteristics and create something completely different. At the age of 16 he dropped out school and started working as a plumber. He carried out this job for several years until TV channel Sky1 hired him to collaborate in a segment of the show Gadget Geeks, where he displayed his knowledge in plumbing alongside some engineering. While Colin was collaborating in Gadget Geeks, he opened his YouTube channel where he uploaded segments of the TV show and experiments he used to do on his own account with his friends. On 2010 he decided to change his YouTube channel to do homemade videos in his garage using common objects for his experiments and show the whole process. His first video, an electric mobility scooter with a propulsion system, was a huge success that led to his leaving the TV show and starting his career as a full-time youtuber. He has broken three Guinness world records since: the world biggest bonfire, the world longest motorbike and the motorized scooter. Each video is more difficult than the previous one, because they are inventions based on imaginative objects, where the most important part is the way Colin explain the process. He has so much fun doing it that it is contagious. Today, he receives requests to create stuff that he then sends to people, brands sponsor him to promote events or products. One time he created a claw to climb walls based on the videogame Assasin’s Creed: Syndicate. Colin Furze has a restless mind that does not believe in limits. He made it this far thanks to his determination and dedication. His inventions are not impossible to make, only wit, patience and creativity are needed. Are you a creative engineer? Do you want to have fun while creating new inventions?